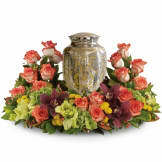 Soft lavender and green blooms to surround the urn, like a peaceful, contemplative garden. 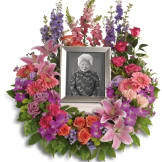 This arrangement is a soothing way to honor the memory of someone close to you. • A subdued assortment of flowers such as lavender larkspur, roses and asters are grouped beautifully with the rich greens of cymbidium orchids, chrysanthemums, English boxwood and sword fern. 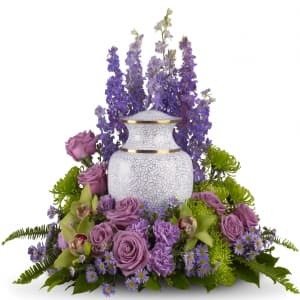 • This arrangement measures approximately 23 1/2" W X 20" H.
Our deceased loved gardening and this gorgeous arrangement surrounded his urn with a beautiful garden with quality flowers. 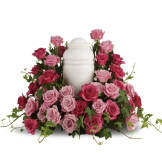 Everyone loved it, especially his widow.